Articulate 360 Teams can easily collaborate on Rise 360 courses. Create and edit different lessons in a course at the same time or take turns fine-tuning the same lesson. Let Articulate CTO Arlyn Asch introduce you to Rise 360 collaborators in this video, then check out the details below. Collaborative authoring is exclusively available to Articulate 360 Teams. Not a teams subscriber? Contact an Articulate 360 Teams specialist to learn more. Tip: You can also send a copy of a Rise 360 course to another Articulate 360 user. However, each of you will have an independent copy of the course, which is useful when you’re working with an individual Articulate 360 subscriber. It’s not real-time collaboration as described in this user guide. You can add as many collaborators as you want to a Rise 360 course as long as they have an Articulate 360 Teams subscription. Collaborators don't have to be on the same team; they just need to have an Articulate 360 Teams subscription. Go to your Rise 360 dashboard and open the course on which you want to collaborate. Enter an email address for each team member who should have access to the course and click Invite. Click Close in the upper right corner to return to the course editor. Each team member you invite will receive an email notification, and the course will automatically appear on his or her Rise 360 dashboard in the Shared with me folder (as well as the All Courses container). Collaborators will also see the owner's avatar on the course tile. Everyone on your team who has access to a Rise 360 course can work on it simultaneously. Changes appear immediately. Here’s how each feature works with collaborators. Only one author at a time can edit the course title and description. When someone else is editing either field, it’ll turn gray and you’ll see the author’s profile picture or initials beside it. Anyone can change the author that displays in the published course. Just click the Author drop-down list and choose one of the collaborators or hide the author altogether. All collaborators can add new section headers and lessons to the course outline. Only one author at a time can edit an existing section header. When someone else is editing it, it’ll turn gray and you’ll see the author’s profile picture or initials beside it. You can edit any existing lesson in the course unless someone else is currently working on it, in which case you’ll see his or her profile picture or initials and when the last edit occurred beside the lesson in the course outline. If you click the Edit Content button for a lesson that another author is currently editing, you’ll have the option to take control of the lesson. We recommend contacting the other author, as a courtesy, before taking control of a lesson, since taking control will lock him or her out of the lesson. All collaborators can delete section headers and lessons unless they’re currently being edited by other authors. All collaborators can rearrange section headers and lessons in the course outline—even when they’re being edited by other authors. All collaborators can preview the course. Only the course owner can share the course with learners, publish it to Review 360 to collect feedback from stakeholders, and export it for hosting in an LMS or web server. Here’s how to transfer ownership to another author. Only the course owner can change the course settings, including theme, navigation mode, text labels, and collaborators. Only the course owner can send, duplicate, move, delete, and restore the course. Go to your Rise 360 dashboard and open the course you need to edit. Hover over each team member you want to remove from the course, click the X that appears, then click Remove to confirm your choice. When you remove collaborators, the course will disappear from their Rise 360 dashboards. 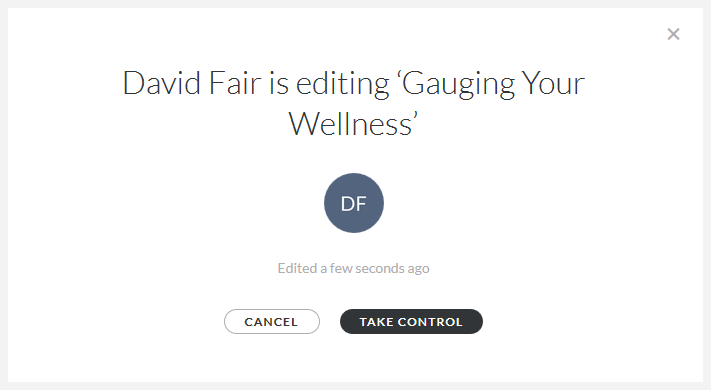 If they’re editing the course when you remove their access, they’ll immediately return to their Rise 360 dashboards. Go to your Rise 360 dashboard and open the course you want to transfer. Hover over your name in the list of collaborators and click the Transfer link that appears.